It’s official. We’ve been to Japan and back, wrapped on the filming of “Persimmon” and are now entering into the post-production process. It has been an amazing journey and one of the best experiences I’ve had in film school thus far. It was amazing to see the crew come together as a cohesive whole. 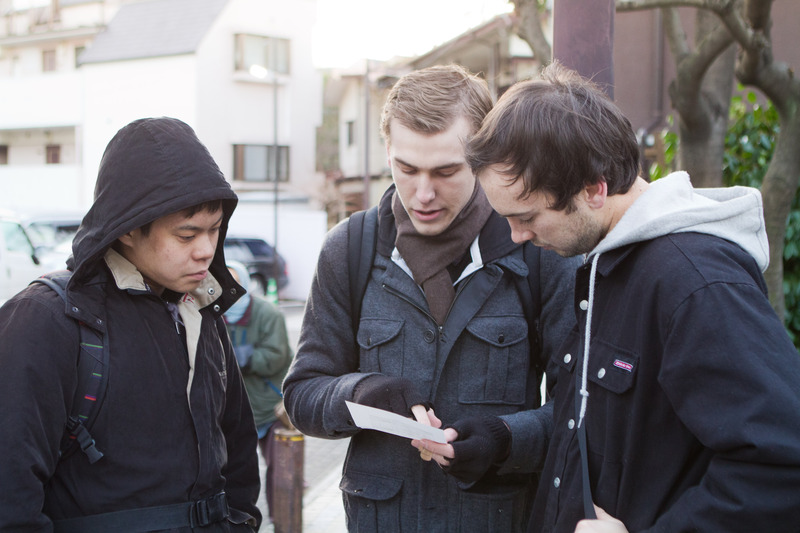 Over the course of many long days of shooting and what seems like a thousand train stations, every person on this crew gave their all to “Persimmon.” It was especially cool to see the way that the Biola crew and the Japan-side crew collaborated despite our differences for the good of the project. We truly could not have made this film work without assistance from Yu, Takaki, John, Steven, Izumi, Maki, Kevin, Julie, Eric and all the others. As we worked together, ate together, traveled, laughed and even sang together, I was able to experience a unique kinship between crew members that I don’t think I will ever forget. I love the fact that Osusowake (sharing) became far more than just a theme of the short film we were making: We truly put it into action together every day. I can only hope that I will take what I learned and allow it to change the way I work and interact with others in the future. 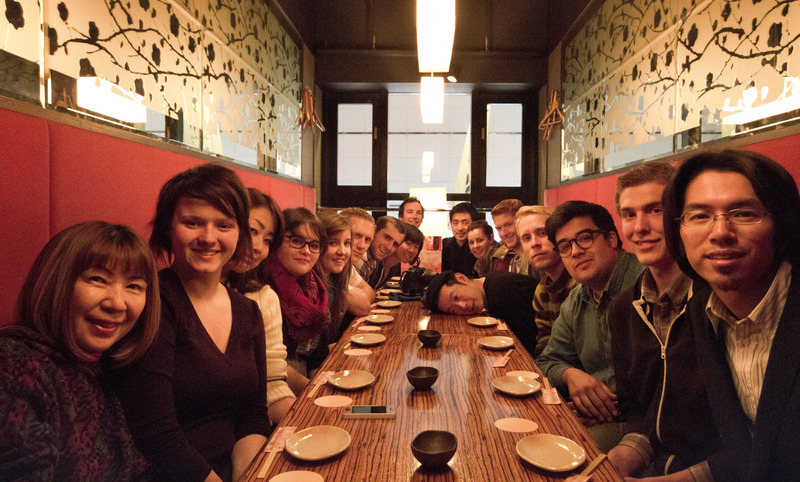 After Japan, there are countless memories…far too many to be expressed here. We shared experiences, travels, inside jokes, new and exciting foods, and the excitement of convenience stores and vending machines together. We exercised creativity, creating beautiful images with the RED and probably thousands others with our brigade of SLRs. We froze on a metal roof for a night, we experienced Japanese karaoke to the fullest, we ate food from a street fair and drank pancakes out of a can. These are a few of countless memories I will never forget, and I am so grateful for the people I got to share them with. I grew up thinking that Japan had something that I didn’t and by going there, a part of me, maybe some cultural identity section of my existence, would be completed. I suppose this wasn’t inaccurate, but I expected to visit solely as a recipient, not as a benefactor. It was a reminder and a wake up call arriving in Japan hearing Yu Shibuya state the heart he wanted us to have on this shoot: something along the lines that we are here to bring hope to a land that has wandered into an ether of tradition, naturalism, and unsteady spirituality, starving for a beacon to an absolute truth. We were commissioned here by something greater than ourselves to tell a story hinting at the ultimate and the real. We were not here to just receive from Japan, but we were here to bring a gift. I became ill on the way to the airport to Japan and my immune system only deteriorated over the long flight. I remained sick for the first location scouting day, and with my nose incessantly draining runny battery acid into my neck, I had little hope of recovering in 4 degrees celsius weather on five hours of sleep a night. Eventually I had to take a day off, my body revolting against my audacious behavior, and I felt like I was betraying the team. My job was to be present, physical, and at the ready, and instead I was unable to even move out of my bed to eat. I began to despair, and wondered why would God bring me here to just waste a chance to experience the land of my ancestors, and to not fulfill the role that this entire family of friends entrusted me with? But I remembered that this was a mission for Japan, not just a film for our benefit. Spiritual warfare is real, and I saw this sickness as well as that of some of the other crew as confirmation that this film was a maneuver that was important enough to be noticed. It made me realize this is something the opposition doesn’t want made. Which probably means we are doing something right. Going over the gorgeous dailies when the rest of the crew got back that night, it made sense. What we were seeing was almost too good to have been made by our mere hands. We had gotten some kind of help elsewhere. We needed God and we needed each other to do this, and it was a project and a process that would only be possible if it was shared. There was not one person who would or wanted it to be about them. I think this theme of sharing with a neighbor some of a large gift you’ve received, or Osusowake as it’s called in Japanese, really became the theme of the shoot. 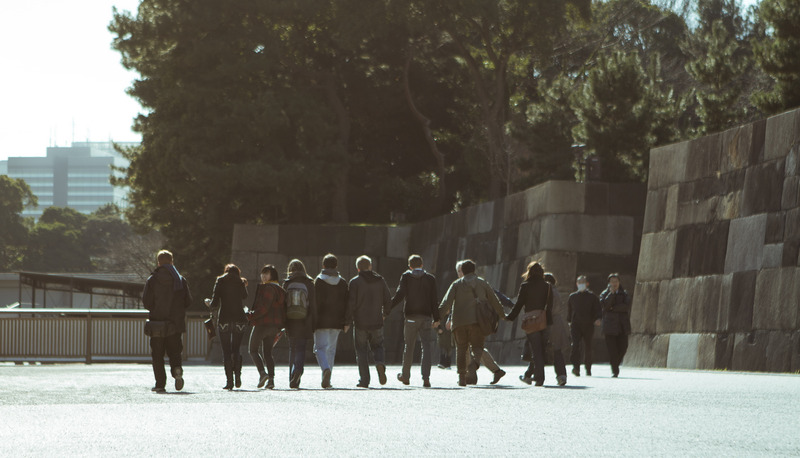 Our mission in Japan was not merely to make a film, but it was to share the gift we’ve received from God with the people of Japan and everyone who would see this film. We were living the beauty of the message of the film each day: the beauty of what death can be and the enrichment it can bring to life. I think the knowledge that this film would have a death, that it wouldn’t be everlasting made each day something worth cherishing, and the death of the shoot is in a way the birth of the film, and we were all working towards this paradoxical goal as a team, sharing with one another everything. From food, to jokes, to even a cohesive attitude of tenacity and trust, we were all there to serve each other. Even our director Dean Yamada, who could have easily tried to micromanage the many creative and technical aspects of the film which he delegated to mere college students, he trusted us in doing our jobs and granted us the honor of truly being able to give ourselves to this project as much as we wanted within our roles. Jordan Crabtree cut together a beautiful montage of scenes from the film just for the first wrap party to see, and it’s been a very long time since I’ve felt the kinds of emotions that I did while watching that preview. Dean did a brilliant job directing the actors and orchestrating the story, Yugo’s performances were arresting, Zack and Nick’s work composing the shots and dressing the set and look of the film was visibly effective and gorgeous… I could go on. But I didn’t see names. I saw all of us all at once. I saw Joey and Trevor helping Zack compose the shots that even were inspired by the lights Jordan set up with Steven and I, and that couldn’t be divorced from the energy that Nick, Takaki or Angela displayed at a lunch break, which we had because Rachel, Ellie, Maki or Brian were all doing their jobs so our worries were minimized to our own tasks, which is rare for a crew that small. I couldn’t be more proud of everyone and honored to be serving such a God in such a way, with people like this crew. So in the end Japan did give me a lot. It gave all of us a lot, and others can talk about that here, and I really hope that we can give back like how I know the crew has been giving to each other during this entire trip. Persimmon. A film by a family who received much and just had to share. It feels surreal to be wrapped. We arrived just over a week ago; after six amazing days of production, we have a film in the can– one that we are all extremely proud of. We collaborated; we pressed on through the long hours and cold days; we created art and built relationships that will exist forever. On Monday and Tuesday, the team had the incredible privilege of being in the presence of three brilliant actors. As director, I needed to create a safe environment and give them the space to do their best work. 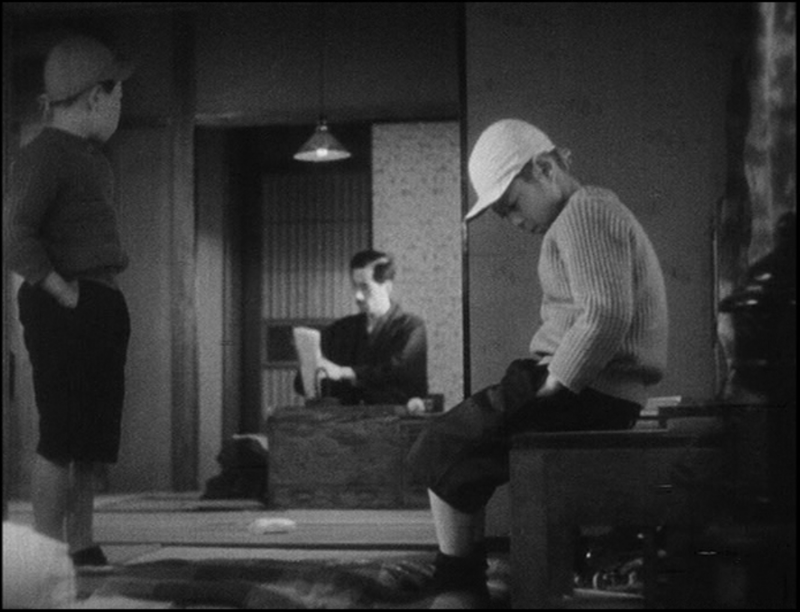 Without authentic performances, this film would be nothing but beautiful, empty images. It was important for the students to see their process as we searched for inspiration and blocked our scenes. Because these actors understand their craft deeply, they need to find ways to put themselves in the scene, whether through connecting with a piece of wardrobe or wanting to know why their character would stand in a specific place of the frame. 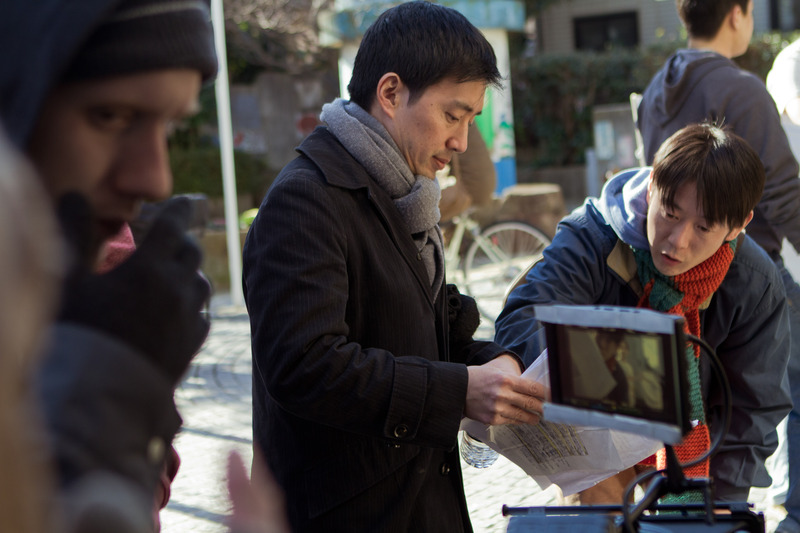 Our lead actor Yugo Saso made the film happen with his generosity and his performance. Throughout our rigorous shooting schedule, I never heard one complaint from him. He trusted our process of making this film and was always ready to go. After working with Masayuki Yui (who plays Hasegawa), it was easy to see why Akira Kurosawa would want to cast him in four of his final five films. Yui-san is a naturally gifted actor who can read a line ten different ways and still keep it fresh while making it his own. Sakae Kimura (who plays Hasegawa’s son) is the consummate professional, who came well prepared with many ideas about his relationship to each character. It was an invigorating time of creating art. Production was like a 144-hour long day with three hour naps interspersed throughout. When we wrapped our final scene at the convenience store, the owners wanted all of us to sign a commemorative card and take a photo with them. It was such a surprise to have them bring us coffee and dried persimmons. As I bit into the dried persimmon, it was a bittersweet moment to know that our time, though not without its challenges, had come to an end. We have made it through production without much compromise, and I’m so excited to begin our journey through post-production and into the festival world. 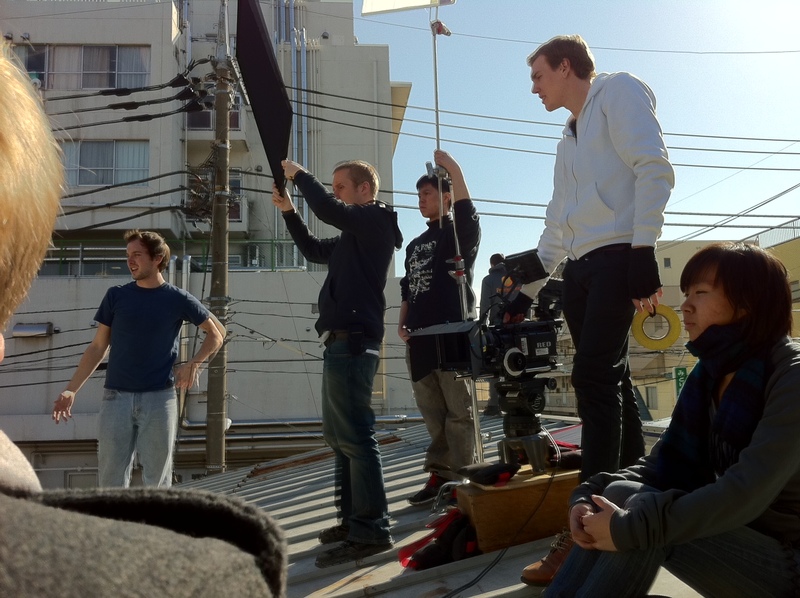 Shooting on the roof of the abandoned clinic. Two days ago marked the end of our shoot, and also stands out in my mind as one of the most ridiculous, hysterical days of filmmaking I have ever lived through. 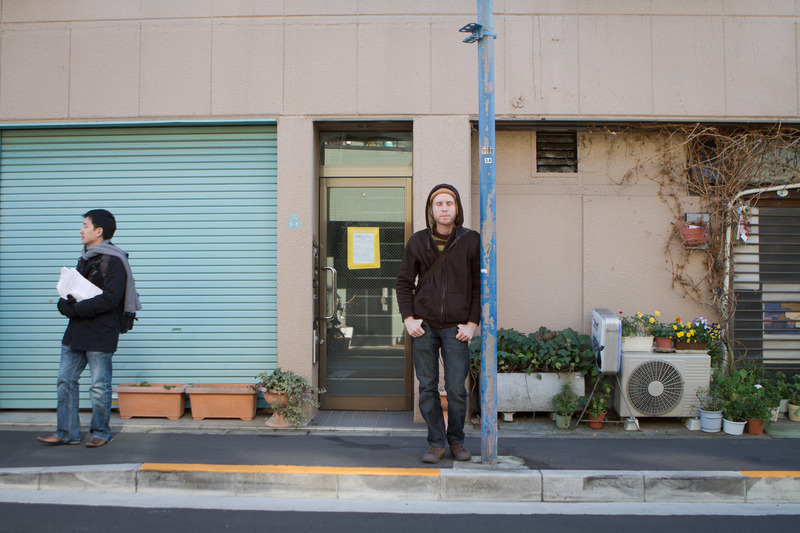 We needed to get a few shots inside the Mitaka train station as well as on the train, but we had no permits. Without permits, we were told we’d be shut down within a matter of minutes. The Japanese metro officers inside the stations are on constant lookout for large groups of caucasians with giant cameras and no documents. My job was to distract these vultures while Trevor, Zack, and Joey set up the camera and pulled off the shots. Imagine the Ocean’s 11 Crew shooting a film instead of robbing casinos. We had a blueprint plan the we formulated beforehand, and we had to be quick and secretive. I rushed into the station first, obviously wearing my tuxedo and sunglasses, and approached the observation/help desk that happened to be yards from our camera setup. I stepped up to the Japanese officer on duty, feeling a hundred percent like James Bond, except this is a James Bond who is nervous, lanky, and can only speak English. I immediately blocked his view of the camera position by leaning so far across the counter that my feet left the ground. It was a rather flirtatious position, and I think he thought the same because he almost tripped over his feet to avoid my maneuver. At this point, I hadn’t said a word to the guy, but had already established with my body language that I was interested in a mild friendship at the very least. My first question was how to get to Mount Fuji. He didn’t understand a word of the question, though, so I asked again. Still no response, so I asked again. Still no response, so I started making the universal shape for a mountain with my hands while saying “Fuji, Fuji, Fuji” over and over again. Finally he got the idea, so he pulled out a map and showed me how to get there. I didn’t understand a word of it. Ten minutes later, I glanced over my shoulder and realized they weren’t done shooting, and I didn’t know how to distract him any longer, but one of the few phrases I know in Japanese is how to ask someone’s name. “O namae wa,” I said. He stared blankly at me for at least a good, awkward five seconds, then he told me his name. Then I told him mine. We shook hands and I was gone. I’m pretty certain he didn’t sleep that night. Call me a creep, but at least we got the shots.